A. All but one of the buildings on the west side of Riverside Avenue were torn down when Route 9 was built. 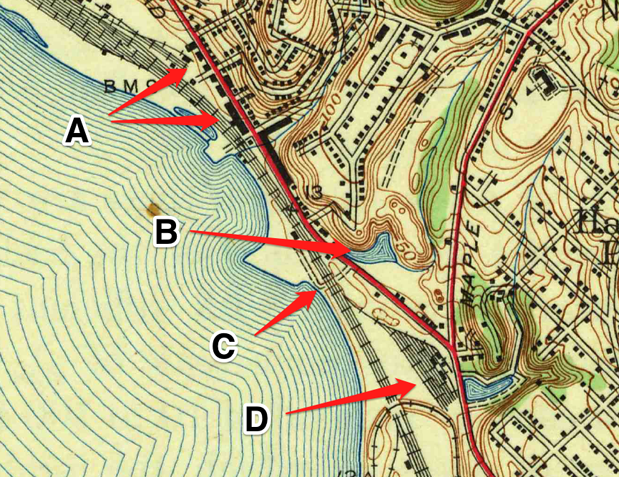 The exception is the old Croton train station, which today is the office of F.A. Burchetta Co., electrical contractors. B. This isn&apos;t the Duck Pond, it&apos;s the area where Croton Auto Park is today. In the late 19th and early 20th centuries this was the site of a brickyard, so the pond shown here is most likely water filling in the excavation area. C. Ed Rondthaler&apos;s beloved "Picture Tunnel" under the railroad tracks. D. These railroad side-tracks across from the Duck Pond were removed to make way for Route 9, but what&apos;s even more interesting is that the area where the tracks were located was filled in. 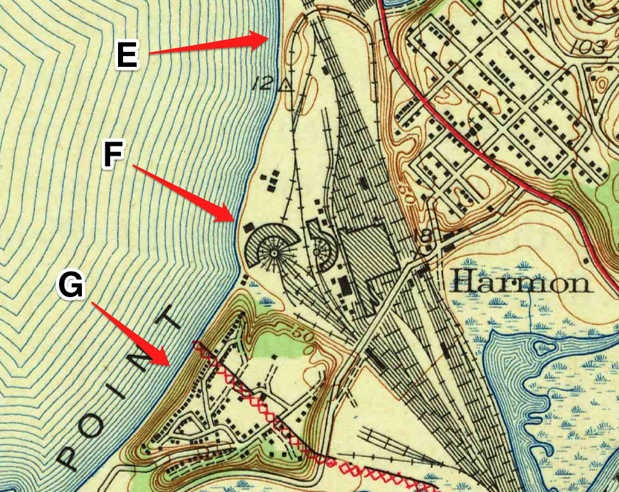 The curve of Riverside Avenue at this point most likely follows the original bank of the Hudson River. E. This curved bridge, which allowed some north-bound trains to loop back around, is still with us today. It&apos;s the bridge you drive across to go to Half Moon Bay, Senasqua Park, the Croton Yacht Club and Croton Landing. F. A round-house for trains, when Croton was an even bigger railroad facility than it is today. 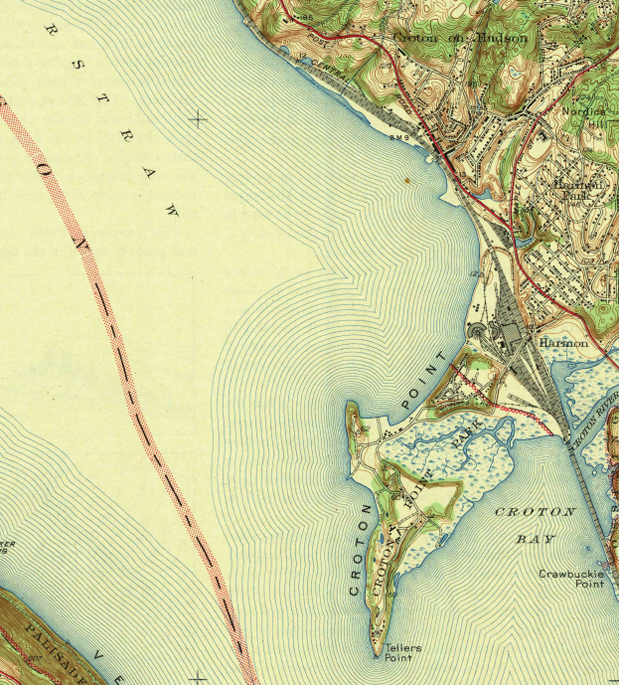 G. The bungalow colony that existed on Croton Point, shown in exquisite detail. If you&apos;re interested in learning more about the colony check out the new Facebook page, Croton Point Bungalows. If you’re interested in what existed in the same place hundreds of years earlier—the Lenape fort and cemetery, the Haunted Hollow, and Money Hill—where Capt. Kidd was said to have buried his treasure—stay tuned.